The 96th Division opened its attack at 0800 on 6 April after a preparation by carrier air. The 2d Battalions of the 382d and 383d Infantry drove against Japanese positions southwest of Ginowan, while flanking assault battalions supported the attack by fire. Japanese artillery and mortars hit the advancing troops immediately and made the day's progress costly. Heavy machine-gun fire from hill positions to the front was silenced only when assault companies occupied the strong points and blasted and burned out the enemy gunners. At nightfall, after an advance of about 500 yards, the division consolidated defensive positions all along its front. The reserve battalion of the 383d Infantry was moved into the center of that regiment's line on the division right flank, while the three battalions of the 382d formed a chain that reached back to the forward positions of the 7th Division. position 1,000 yards west of Minami-Uebaru that dominated the area of advance. Two frontal assaults, one supported by tanks, failed in the face of heavy fire; six tanks were lost to bomb-mines, AT and artillery fire, and the satchel charges of individual Japanese tank hunters. The hill which had been fanatically defended was finally taken when the battalion made a wide flanking movement to the right and drove up its slopes behind a heavy artillery and supporting weapons preparation. Again, as on 6 April, the reduction of an enemy strong point in the 184th Infantry zone enabled the entire division to advance, and probing patrols of the 32d Infantry reached the northern edge of Yonabaru airfield. 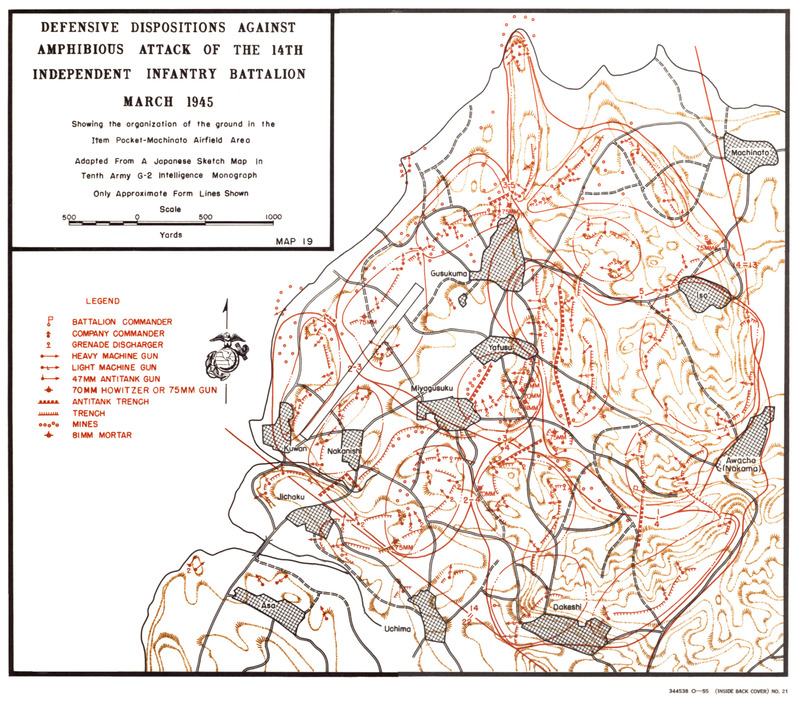 The interior assault battalions of the 7th and 96th Divisions, 3/184 and 1/382, tied in during the advance on L-plus 6. The 382d Infantry, moving through the broken ground fronting Kaniku, was able to secure about 300 more yards of hotly contested terrain, but halted its advance early in the afternoon generally 400-500 yards from the village in order to mop up bypassed positions and support the attack of flanking units. On the right of the corps advance, four battalions of artillery, three air strikes, and the 14-inch rifles of the New York were called upon to clear the path for the attack of 1/383 on the wooded ridges guarding the approaches to Kakazu. The battalion was able to advance 1,000 yards under cover of this supporting fire and reach positions approximately 500 yards north of Kakazu by 1600. By 7 April it became apparent that the XXIV Corps was entering the Thirty-second Army's main defensive zone. General Hodge requested the attachment of additional artillery battalions to his corps to assist in the reduction of prepared positions. General Buckner, realizing that III Corps Artillery could not be used to maximum effectiveness in the north, ordered the assignment of most of the Marine 155mm units to the southern front. On 7 and 8 April, the 8th and 9th Gun Battalions and the 1st, 3d and 6th Howitzer Battalions were detached from IIIAC and moved south to support the XXIV Corps attack. The howitzer battalions were assigned to the 419th Field Artillery Group and paired off with similar Army units in three firing groupments controlled by the respective Army battalion commanders. The gun battalions and a headquarters detachment joined the 749th Field Artillery (8-inch howitzers) in a provisional group named after and commanded by Lieutenant Colonel Frederick P. Henderson, G-3 of IIIAC Artillery.4 General Sheetz, commanding XXIV Corps Artillery, now had four 155mm gun battalions plus an 8-inch and six 155mm howitzer battalions available to support the drive on the enemy's defenses. Enemy resistance stiffened on 8 and 9 April as the Americans ran into increasingly stronger defensive positions. In the 7th Division zone, the 184th Infantry made the main effort in the face of heavy artillery and mortar fire. The regiment gained 1,600 yards in two days' action, taking and holding a tomb-studded hill that dominated both the coastal area and the high ground stretching to the boundary of the 96th Division. With the threat of flanking fire eliminated, the 32d Infantry was able to move its main strength forward on 9 April to the hills north of the village of Ouki. The 7th Division was now well within range of the enemy's first line of defenses after knocking out the major outposts in its zone of action, and its progress from now on would be measured in hundreds of feet rather than yards. In the center of the XXIV Corps front the 382d Infantry, using all three of its battalions in assault, drove on Kaniku and Nishibaru, its objective the ridges which dominated both villages. Enemy flat trajectory weapons in mutually supporting pillboxes and cave positions combed the high ground while artillery and mortars filled the defiles and terrain corridors with accurate fire. Assault units reaching intermediate objectives were subjected to severe flanking and frontal fire which pinned down the infantrymen. At the close of day on 9 April, the 382d was still short of its objectives and badly depleted by the punishment it had taken. The effective strength of its rifle and heavy weapons companies was 61 per cent. The 383d Infantry was in even worse physical shape by dusk of 9 April with division accounting its assault units only 45 per cent effective. For two days the regiment had attempted to gain a toehold on Kakazu Ridge, the strongest enemy position yet encountered by the 96th Division. Moving forward through dense undergrowth and across low ground that was covered by pre-registered artillery, mortar, and machine-gun barrages, assault companies of 1/383 and 3/383 finally reached the ridge crest on 9 April. They immediately came under fire from hidden weapons emplaced in the ruins of Kakazu and were subjected to continual counterattacks by defending troops of the 13th Independent Infantry Battalion. All day long the beleaguered units on the ridge held out, taking a steady drain of casualties, while reinforcements were cut off from them by the enemy barrage. Finally ammunition was exhausted and the survivors withdrew to the previous night's positions; 23 men had been killed, 183 wounded, and 47 were missing in action as a result of the day's fighting on Kakazu Ridge. An even more significant event had taken place on 9 April. At noon, the 27th Infantry Division (less RCT 105) was assigned to XXIV Corps from Tenth Army reserve. General Griner and members of his staff reported to General Hodge for orders at 1300 and the division convoy which had come up during the night began unloading that afternoon. Personnel of the 106th and 165th Infantry, division artillery, and some special troops were landed before dark. Torrential rains limited visibility and curtailed the effectiveness of supporting weapons on 10 April when XXIV Corps renewed its attack. The 7th Division was able to gain an average of 400 yards with the 184th Infantry using armored bulldozers to close enemy firing ports in the hill positions in its zone. On the division left, the 32d Infantry advance over the coastal flats was halted by a defended mine field and AT ditch outside Ouki and the regiment was forced into a slow advance along a series of finger-like ridges that jutted out from the higher hill mass to the west. All three regiments of the 96th Division participated in the attack on the Kakazu Ridge area on 10 April. The rain, however, precluded aid from the three squadrons of carrier fighters that were to fly support, and the weight of bombardment was left to artillery and NGF. The long-range guns of corps artillery and supporting warships interdicted the enemy rear areas from 0530 to 1130 and division artillery, now six battalions strong, fired an intensive preparation for the attack from 0630 to 0700. The 382d Infantry attacking with the 3d, 1st, and 2d Battalions from left to right met the strongest resistance it had yet encountered from Japanese positioned on high ground around Kaniku. Mud-bogged tanks were ineffective, and their support was lost to troops advancing across fire-swept low ground. The 3d Battalion moving along the division boundary made only 200 yards before frontal and enfilade fire forced the unit to dig in. A strong Japanese counterattack, supported by machine guns and 320mm mortars, inflicted heavy casualties on 1/382 when it tried to move along a ridge line east of Kaniku and forced it to withdraw to defiladed positions north of the village to escape the crippling fire. Another counterattack struck 2/382 as it tried to outflank Kaniku on the west and drive a wedge between it and Kakazu. The Japanese overran some of the battalion's forward elements and wounded its commanding officer, but the unit clung to hill positions midway between the two enemy strong points. The men of 2/382 were already under fire from an even more formidable objective just a few hundred yards to the south, the precipitous ridge that guarded Nishibaru and paralleled the enemy position at Kakazu. In the 383d Infantry zone, 2/383 passed through 1/383 in its position in front of Kakazu and attacked toward the ridge at 0700. Slowed immediately by enemy fire, the battalion was able to inch forward 300 yards by noon before the hail of artillery and mortar shells stopped its advance. On the regiment's right, 3/383 coordinated its attack with 2/381 which had driven forward from its reserve positions during the night. Wheeling wide around the end of the ridge under cover of 3/381's fire from Uchitomari, 2/381 was able to drive directly east and secure positions on the west end of the ridge line, a small hill called Kakazu West separated from the main ridge by a dip in the crest. The battalion was unable to advance farther on Kakazu Ridge because of the terrific wall of fire put up by the defenders. The 381st Regiment's reserve, 1/381, was called forward during the day to cover a gap between 2/381 on Kakazu West and 3/383 in position 300 yards north of the main ridge. aerial suicide attacks. The assault units were to infiltrate American forward positions and inflict as much damage as possible in rear areas where their close intermingling with friendly troops would protect them from the fire of naval guns and artillery. The counterattack objective was an area 1,500 yards north of Futema stretching roughly from Chatan on the west coast to Shimabuku in the center of the island. While the Japanese readied fresh infantry units for a counterattack, the 7th and 96th Divisions spent 11 and 12 April consolidating their gains of the previous week. The 1st Battalion of the 381st Infantry pushed forward 300 yards on 11 April by dint of desperate hand-to-hand fighting to improve the regiment's hold on Kakazu West and its northeastern slopes. On 12 April the battalion was repulsed in three separate attacks on Kakazu Ridge by intense enemy mortar, machine-gun, rifle, and grenade fire. Even an air strike and the combined fire support of 2/381 and 3/381 were unable to beat down the enemy resistance. Although heavy surf conditions during this period hampered unloading of the 27th Division's heavy equipment, its infantry was committed to strengthen the XXIV Corps position. On 11 April the 106th Regiment was attached to the 96th Division and closed on that division's reserve area at 1500, while the 165th Regiment, with elements of the 27th Reconnaissance Troop attached, relieved the 17th Infantry of the 7th Division of the mission of defending the corps service area. On 12 April 2/106 relieved 3/381 on its positions west of Uchitomari in the first movement of 27th Division troops into the XXIV Corps front line. Shortly after midnight on 12-13 April enemy mortars laid down a barrage on the 381st and 383d Infantry's positions, and three company-sized counterattacks were launched against the American front lines. All were driven back as artillery and small-arms fire caught the attackers in the light of NGF star shells. At 0300 a 1,000-round artillery concentration began falling on the 96th Division's forward area and enemy attacked again, this time in battalion strength. At dawn the Japanese survivors withdrew, followed all the way by a hail of American artillery, mortars, and naval gunfire. Infantry drove off the attackers with mortars, grenades, and small-arms fire. Despite the fact that XXIV Corps estimated that it had accounted for 6,883 enemy dead by 14 April,16 its identifications of front line units opposing its advance still consisted mainly of the 12th, 13th and 14th IIB's of the enemy's 63d Brigade. Even the addition of elements of four new battalions to the line after the 12-13 April counterattack did not account for the continued presence of infantry units that should by all rights have been virtually destroyed. The resultant difficulty in maintaining an up-to-date enemy order of battle at Tenth Army headquarters was a direct result of the operation of the Thirty-second Army's replacement system. Individuals and small groups from service and support troops were being gradually fed into forward units while whole companies and battalions not yet committed as integral units were absorbed temporarily, permanently in some cases, into the existing defensive setup. had given Tenth Army intelligence officers a fairly accurate picture of Japanese defensive plans. They also had been forced to revise their L-Day estimate of enemy troop strength upward from 65,000 to 72,000 which was "deemed a conservative minimum. "19 It was clear that the reduction of the Shuri fortress would be a tedious process involving tremendous expenditures of men and matériel. Command restrictions on the expenditure of ammunition had been applied as early as 9 April when it became evident that the rate of arrival and discharge from ships could not keep up with the tremendous volume of fire poured out by battalions supporting the XXIV Corps.20 The nature of the enemy defenses surrounding Shuri dictated the maximum use of artillery to reduce these prepared positions, strip off the camouflage that concealed them, and if possible close the firing ports and collapse the warren of interconnecting tunnels that housed and protected the defending troops. Corps and division artillery formed the backbone of the assault support since, unlike air and NGF, their firing was little restricted by weather or enemy air attacks. Combat troops were as vitally needed as supporting fires for the coming attack. Part of the requirement was met by narrowing the division zones of action and committing the 27th Division on the right of the corps line. Some attempt was made to alleviate the battle losses of the 7th and 96th Divisions by dividing between them 1,117 replacements that arrived from Saipan on 13 April. All Army divisions remained short of infantrymen even after the replacements joined, however, since losses sustained in their previous campaigns sent them to the target understrength. The 27th Infantry Division, originally assigned only reserve roles, was nearly 2,000 men short of table of organization (T/O) strength, while the 96th Division was short 1,000, and the 7th almost 400. In contrast, the Marine divisions' attached replacement drafts enabled them to embark with a five per cent T/O overage. On 15 April General Griner assumed responsibility for the corps right flank, and 3/106 relieved 2/381 on Kakazu West. The 381st Infantry, in turn, took over the positions of the 383d which then moved to the corps service area to relieve the 165th and enable its release to 27th Division reserve. The following day elements of the 105th Infantry, which had been released from army reserve after the capture of Tsugen Shima, began moving into the left of the 96th Division's positions enabling the 381st Infantry to shift correspondingly and narrow the 382d's zone of action. Thus, two days before jump off, the initial assault dispositions had been made. the estuary separating XXIV Corps front lines from Machinato. The 105th Infantry occupied positions on Kakazu West and to the north of Kakazu. The 381st Infantry, holding a salient in the enemy lines, occupied the ground in front of Nishibaru Ridge and the lines of the 382d stretched back to the hills before Kaniku. On the left of the corps line, the 184th Infantry was positioned in the rugged hills 1,500 yards north of Tanabaru and the 32d faced a prominent ridge rising abruptly south of its lines at Ishin and Ouki. At 1630 on 18 April, Company G of the 106th Infantry made a daring daylight crossing of the water barrier in engineer assault boats under cover of a heavy smoke barrage. Taking the enemy by surpise, the company secured Machinato at dusk. While artillery and mortars fended off enemy counterattacks, the 102d Engineer Combat Battalion began construction of a foot, a pontoon, and two Bailey bridges.24 By midnight the footbridge was completed and the rest of 2/106, with the 27th Reconnaissance Troop attached, crossed the estuary to Machinato. At 0400 the assault companies, undetected by the Japanese, moved 1,000 yards through the darkness to a position at the western end of the Urasoe-Mura Escarpment and made ready to assault the heights at dawn. Hidden in their caves deep within the hill-ridge complex, protected by walls of solid limestone, the enemy troops waited for the fire to lift. At 0620 the American artillery shifted its impact area 500 yards to the rear and the infantry feinted an attack to draw the Japanese out into the open. The ruse failed and the artillery came down again on the forward areas. manned more and more of their positions the advance slowed and finally ground to a stop. On the extreme left of the corps front, Skyline Ridge, the knife-like height forward of 32d Infantry's lines, was the initial objective. Tanks and armored flame throwers moving through Ouki burned and blasted a toehold for 3/32 on the base of the ridge. The counterattacks of Japanese defenders holding the reverse slopes, although they were repulsed, prevented the battalion from gaining the crest or flanking the ridge. Finally, the unit was forced to relinquish its precarious hold when 2/32 on its right was unable to penetrate a pre-registered mortar and machine-gun impact area that guarded the approaches to the western end of Skyline Ridge. In the 184th Infantry zone of advance along the division boundary, the attacking companies were also caught in an impact zone and raked by fire from two rocky knolls (Rocky Crags) that guarded the approaches to Tanabaru. The net result of the day's action in terms of ground gained and held was nil. low tomb-studded ridge on its right swept its front. The enemy position, dubbed Tombstone Ridge by the men of the 382d, bristled with well dug-in, interlacing automatic weapons. Using all the fire available from its supporting tanks and assault guns, 1/382 gained and held the northern tip of the ridge and 2/382, with the lessening of fire on its right flank, moved up parallel to the 1st Battalion's positions. A gap which had developed between the two battalions during the day's advance was covered by 3/382 which moved into the center of the regimental zone. The 1st Battalion, 381st Infantry, in position north and northwest of Kaniku at the start of the attack, moved rapidly through the western part of the village and came abreast of 3/381 at 0715. Both battalions then jumped off with their objective the Nishibaru-Tanabaru ridge line. After garnering 300 yards of enemy territory in an almost unopposed advance, the 381st came under extremely heavy machine-gun fire that pinned down the assult troops. Enemy positions on the ridges to the front, at Kakazu to the right of 3/381 and Tombstone Ridge to the left of 1/381, dominated the area. The volume and accuracy of the Japanese fire made further advances impossible during the day, and forward units pulled back to protected defensive positions late in the afternoon. The impetus given the 27th Division's attack by 2/106's night advance was responsible for substantial gains along the west coast on 19 April. 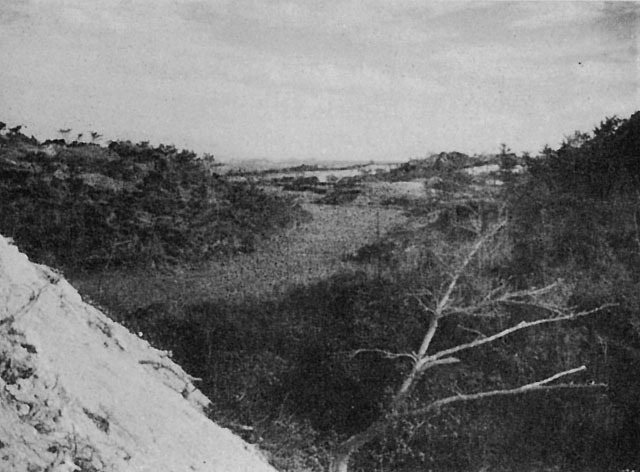 The estuary was crossed by 1/106 at 0515 and a half hour later the 2d Battalion, backed by the 1st, mounted the Urasoe-Mura Escarpment and attacked to the southeast. During the day the 3d Battalion was committed in the center of the regimental zone, and by nightfall the regiment held a 2,000-yard line, forward of the escarpment along the low coastal plain and on the crest of adjoining high ground for the rest of the distance. Resistance, which had been negligible at the start of the day's action, increased sharply as the Japanese in reverse slope positions fought doggedly to halt the 106th's progress. Kakazu Ridge, whose formidable defensive network had blocked the 96th Division's advance for over a week, proved just as tough for the 27th Division to take. The 105th Infantry, with 1/105 in assault, attacked the ridge at 0730, preceded by the full power of the corps artillery preparation. The defenders were not intimidated, and their damaging fire drove the 1st Battalion to cover soon after the jumpoff. The 3d Battalion was committed on the right of 1/105 and bypassed the ridge and village to the west, moving into the low, uneven ground dominated by the Urasoe-Mura Escarpment. Crags continued during the day. Company B of the 17th Infantry was committed on the extreme right of the division zone to reinforce 3/184's attack and the fresh troops gained a purchase on the northernmost height of the Rocky Crags position. Action in the 32d Infantry zone centered on the hill at the western extremity of Skyline Ridge. Late in the afternoon, under cover of a 4.2-inch mortar smoke and shell barrage, leading elements of 2/32 wrested the summit of the hill from the Japanese. Despite counterattacks and constant shelling, the small advance party, supported by fire from 2/184 and 3/32 on its flanks, held its lines throughout the night. In the center of the corps line the second day of all-out assault yielded Tombstone Ridge to the attackers and placed elements of two battalions on the crest of the Nishibaru-Tanabaru ridge line. The 3d Battalion of the 382d Infantry, covered by 1/382 in the positions it had seized on 19 April, pushed south down Tombstone Ridge and succeeded in wiping out enemy resistance by the end of day. When 3/382 came abreast of 1/381, that battalion was able to launch its attack on Nishibaru Ridge and by noon two companies were dug in on its top. At 1320, 2/381 was committed on the right of 1/381 and despite punishing flanking fire from Kakazu managed to get two companies up on the ridge. Neither of the 96th Division's flank battalions, 3/381 and 2/382, was able to advance during the day because of accurate fire laid down by the Japanese on Kakazu Ridge and Rocky Crags. 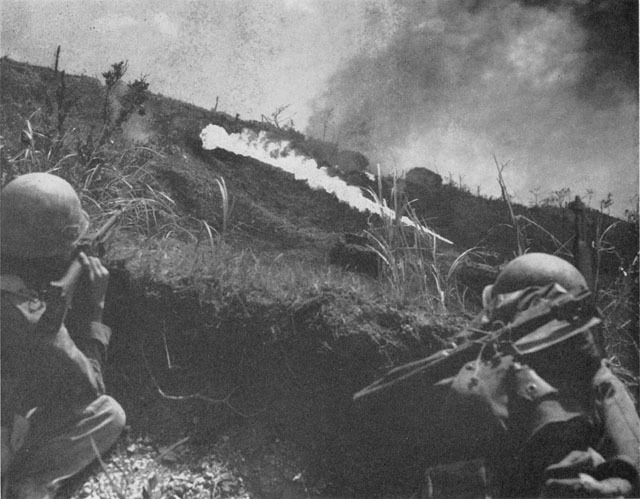 The 106th Infantry, delayed two hours in its jump-off by a heavy enemy artillery shelling, moved down off the Urasoe-Mura Escarpment on 20 April, mopping up reverse slope positions as it progressed. Gains of 500-800 yards were registered by 3/106 and 1/106 as well as 3/105 which moved up on the left of the regiment. 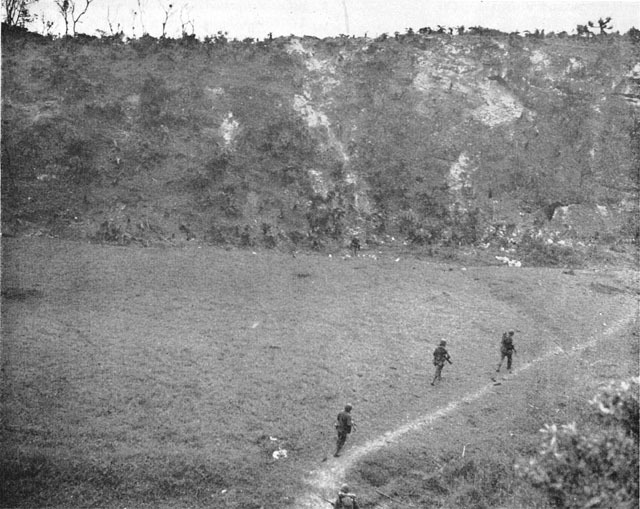 The 2d Battalion of the 105th, attempting to advance over the escarpment near Nakama (also called Awacha) was driven back to its original positions by a strong enemy counterattack which came late in the afternoon. The 105th's 1st Battalion, which had been mopping up Kakazu, had to be committed on 2/105's left to prevent a breakthrough. By sundown the 27th Division had made substantial progress on its right although at a cost of over 500 casualties, but its left flank was still dominated by the bypassed Kakazu ridge position. Casualties had been heavy in all the attacking divisions, but the Japanese were taking a beating. Front line units were being whittled down to skeleton size and only the natural strength of the enemy positions held the XXIV Corps in check. On 21 April, the 32d Infantry seized the entire military crest of Skyline Ridge from the depleted defending companies of the 11th IIB. On the 7th Division's right flank, the 184th Infantry secured its hold on the north peak of Rocky Crags and gained an average of 300 yards throughout the regimental zone. Both 1/381 and 2/381 were unsuccessful in their attempts to improve their hold on Nishibaru Ridge during the day. Deadly machine-gun fire from Nishibaru village pinned the advancing battalions down, and a heavy mortar barrage forced the leading troops to withdraw. Although the 381st's forward progress was halted, 3/382 moved through the 381st's zone of action and captured positions on the crest of the ridge. At 1300, 3/383, previously in division reserve, was committed in the center of the 382d's zone and attacked toward the ridge line. By nightfall the battalion had reached a point 200 yards north of the ridge to the left rear of 3/382. As had been the case in the preceding two days of action, 3/381 was unable to advance on 21 April because of flanking fire from Kakazu Ridge. 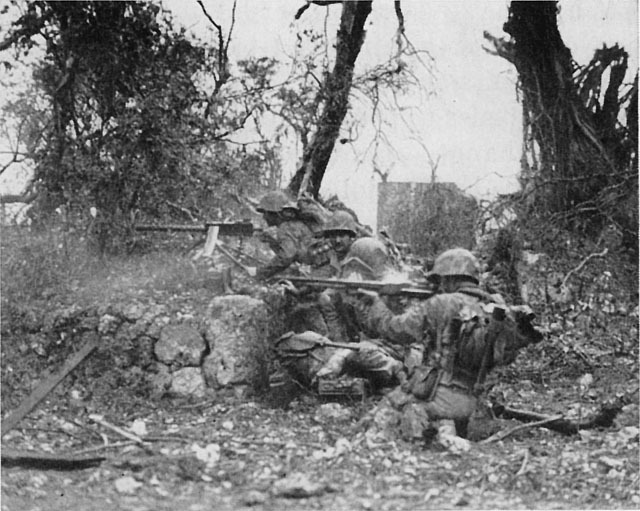 The 105th Infantry, attempting to move east along the Urasoe-Mura Escarpment was unable to hold any appreciable gains because of heavy enemy fire from Nishibaru and Kakazu which covered its rear. On the right of the 27th Division, the 165th Infantry hammered fruitlessly against Item Pocket. Small gains were made on either flank of the position, but the core of enemy resistance remained intact. The 106th Infantry, in the center of the division zone of action, consolidated its hold in the area southeast of Gusukuma during the day. While the 32d Infantry consolidated its gains on Skyline Ridge, the 184th repeatedly attacked the southernmost of the Rocky Crags. Even the direct fire of a 155mm howitzer, added to that of tanks and self-propelled guns, was not enough to blast a way for the assault troops on 22 April. In the center of the corps line, the 381st Infantry held its position of 21 April and covered with fire the relief of the 382d by the 383d. By 1000, 2/383 had relieved 3/382 on the crest of the ridge east of Nishibaru, and an hour later the regiment attacked to the southeast toward Tanabaru. After an afternoon of bitter fighting, the 383d had secured about 200 yards on its right and 150 yards on its left. The 96th Division ended the day with three battalions firmly ensconced atop the ridge (2/381, 1/381, and 2/383) and with two battalions (3/383 and 2/382) ready to push to the top on 23 April. On the west coast the 27th Division conducted mopping up operations on the fourth day of the corps attack. Unit positions were consolidated and contact was established all across the line. General Hodge, concerned about the gap between the 27th and 96th Divisions, directed Brigadier General William B. Bradford, ADC of the 27th Division, to coordinate efforts to reduce the Kakazu position. The 3d Battalion of the 106th Infantry, with the 27th Reconnaissance Troop attached, cleaned out the village of Kakazu by nightfall but held up in the face of mounting opposition from enemy units that still held out on the reverse slopes of the ridge. Kakazu and Nishibaru. In addition, elements of the 27th and 96th Divisions' attached tank battalions, the Cannon Company of the 105th Infantry, and signal and engineer detachments from the 27th Division were included in the Bradford Task Force. An operation order directed that the force seize Kakazu Ridge and establish firm contact between the two divisions. The 96th Division made its main effort on 23 April in the 383d Infantry's zone and by nightfall had managed to get one more battalion, 3/383, into position on top of the Nishibaru-Tanabaru ridge line; 2/382, on the division left, held up just short of the crest after a 200-yard advance during the day. Rocky Crags, on the left of 2/382, had been taken by 1/17 earlier in the day after a relatively brief struggle which showed that the previous days of fighting had wiped out the garrison. The XXIV Corps was ready to throw its full power against the remnants of 62d Division holding the outer defense ring when the attack was renewed on 24 April. But the day was marked by sweeping advances all along the line. During the night, under cover of "the most intensive artillery fire yet experienced on the XXIV Corps front,"36 the enemy had withdrawn his defending forces from the line that had held up the 7th and 96th Divisions for two weeks. Only on the west of the 27th Division's zone, where American advances could outflank the second line of defenses stretching from Gusukuma through Maeda to Kochi, Onaga, and Kuhazu did the stubbornness of the defense remain unabated. The Bradford Task Force had little difficulty in mopping up Kakazu Ridge, the enemy fortress whose defenders had completely stopped attacks of the 96th and 27th Divisions for so long. With the withdrawal of defending forces from the Kakazu, Nishibaru, Tanabaru, and Skyline Ridges, the left and center of the XXIV Corps line advanced 600-1,000 yards on 24 April. The 17th Infantry, passing through the 184th on the right of the 7th Division zone, thrust its assault companies forward to the eastern outskirts of Tanabaru and took the high ground on the right of the 32d Infantry positions on Skyline Ridge. The 383d Infantry, encountering the same lack of resistance, advanced rapidly on the left of the 96th Division, securing Tanabaru Ridge and taking Tanabaru itself. The 381st Infantry, led by 3/381 which finally gained the top of Nishibaru Ridge, came within 400 yards of the Urasoe-Mura Escarpment forward of Maeda. All units put patrols out to locate the next enemy defense line. While the Bradford Task Force mopped up Kakazu, the 105th Infantry strengthened its positions on the escarpment and conformed to the advance of 2/165. By 1600, firm contact had been established on the division boundary between 2/165 and 3/381; 1/105 was tied in to the right of 2/165. The 106th Infantry, in an afternoon attack advanced its lines 400 yards to a point where they paralleled Gusukuma, but the 165th Infantry was unable to make any progress against Item Pocket and its lines remained substantially the same. The following day, in preparation for a planned corps attack on 26 April, the 105th and 106th Infantry remained in position, sending strong patrols to the front. The 165th Infantry, with the 1st and 3d Battalions in assault, continued its attempt to reduce Item Pocket. Due to the broken nature of the ground, individual platoons and companies with scattered tank support battled throughout the day and into darkness. Gains were made all around the periphery of the pocket and elements of 1/165 occupied Gusukuma, but the defending 21st Independent Infantry Battalion still held the pocket itself. high ground which the 7th Division could use as a base for further advances. became overextended. On the west coast, although Item Pocket still held out, the 165th Infantry was able to make further encroachments on all sides of the enemy position and advance patrols to the northern edge of Machinato airfield. Assault battalions of the 96th Division reached the northern slopes of the Maeda Escarpment on 26 April. Progress in the morning was rapid against light resistance, but the fury of enemy fire mounted as men of the 381st and 383d Infantry attempted to cross the escarpment and reach its southern slopes. The escarpment itself, an extension of the Urasoe-Mura heights, was a sheer cliff throughout most of the 96th Division zone and tanks and assault guns could not accompany the attacking infantry. In the face of determined enemy resistance the division dug in late in the morning to hold its gains and spent the rest of the day locating and destroying enemy weapons' positions in its zone of action. The 17th Infantry bore the brunt of the attack in the 7th Division zone on 26 April. Attempting to envelop Kochi Ridge (between Kochi and Onaga) on either flank, 1/17 and 2/17 were driven back by heavy enemy fire. The nature of the compartmented terrain prevented effective cooperation between the assault units. 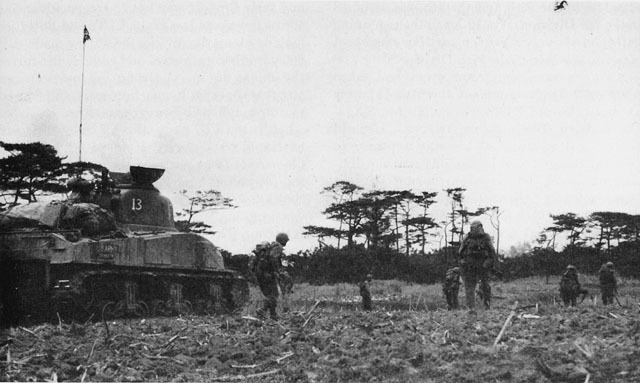 The 32d Infantry, because its right flank was vulnerable to enemy fire from Kochi and Onaga, did not advance but sent strong combat patrols into Unaha and Kashukai to the west and south of Yonabaru airfield. Scattered rains of 25 and 26 April increased to such an extent on 27 April that supply operations and tank support were considerably curtailed. Most action on L-plus 26 was confined to bitter and bloody close quarter infantry combat. The 17th Infantry again failed to take Kochi Ridge and 32d Infantry patrols ran into sharp opposition as they probed the Unaha area. In the 96th Division zone enemy fire made the top of the escarpment untenable and prevented the 381st Infantry from advancing. Average gains of 200 yards were made on the division left by the 383d and elements of 1/381 against extremely intense machine-gun and small-arms fire. During the day the eastern part of Maeda was seized by 2/283, and 3/383 moved to a position generally parallel with Kochi. Most of the assault troops of the 77th Infantry Division, fresh from their capture of Ie Shima, were ashore on Okinawa by 27 April. Aware that his division would probably be committed on Okinawa, General Bruce had had his staff keep current on the progress of the fighting on the main island. Despite the fact that it had fought two major amphibious operations in the short space of a month, the 77th Division was ready to enter the XXIV Corps front line. Plans had been made for it to begin relieving the badly-battered 96th Division on 29 April. As preparations were being made to effect the relief of two divisions on the XXIV Corps front, the attack to the south continued. On 28 April, 3/165, using tanks and assault guns to neutralize fire from enemy pillboxes on its flanks, completed the capture of Machinato airfield. The remainder of the 27th Division made slight advances during the day, securing Yafusu and destroying enemy emplacements in the respective battalion zones of action. On the 105th Infantry's left the stubborn defense of reverse slope positions on the escarpment by the Japanese prevented the 381st Infantry from gaining the fire-swept top. An air strike and the fire of tanks brought up by means of a road bulldozed through the broken ground east of Maeda enabled the 383d Infantry to advance its lines 300 yards during the day. The enemy's savage reaction to the 96th Division's progress featured counterattacks, infiltration attempts, and repeated barrages of artillery and mortar fire. Possession of the Maeda Escarpment was vital to the Thirty-second Army's plans because the terrain offered a commanding view of the whole of the Japanese positions as far as the foothills of Shuri and blocked similar enemy observations within American lines.43 The region surrounding Maeda became the focus of continuous enemy attempts to regain the dominating ground of the second ring of Shuri defenses. 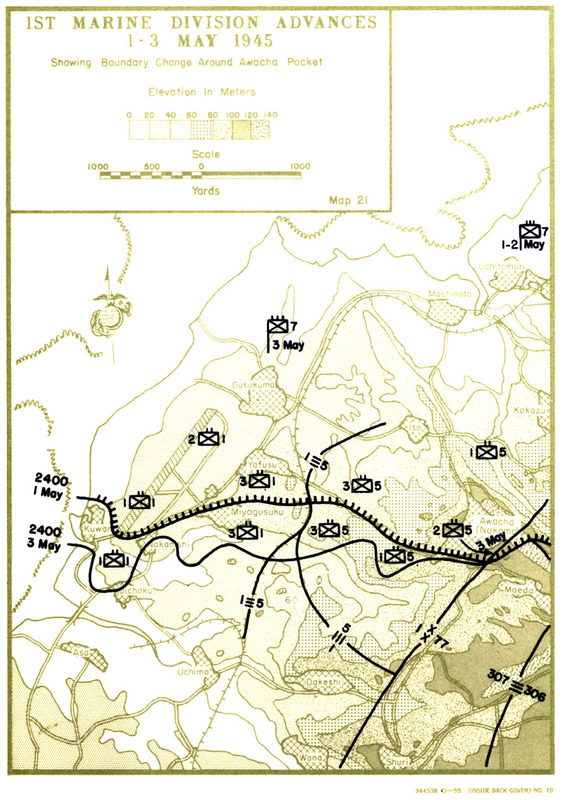 The 7th Division's moderate advances on 28 April secured Kochi and Onaga, but the 17th Infantry was still unable to maintain a purchase on Kochi Ridge. The 32d Infantry managed to advance armored flame throwers into the village of Kuhazu, but accompanying riflemen were stopped by heavy mortar concentrations. The story on the following day was much the same. The 17th Infantry advanced slightly on both flanks of Kochi Ridge while the 32d pushed reconnaissance patrols as far forward as Gaja. Any attempt to put more than a few men into the broken, abrupt terrain in the Kochi-Onaga-Kuhazu area was instantly met by deadly concentrations of small-arms, mortar, and artillery fire. The 307th Infantry of the 77th Division, which had moved into reserve positions in the 96th Division zone on 28 April, began relieving the 381st Infantry the following morning. As soon as the assault battalions, 1/307 and 3/307, attempted to attack they ran into the same furious wall of devastating fire that had met the 381st. Constant pressure was maintained during the day but gains were slight against the highly developed defense system. The 3d Battalion of the 383d Infantry on 29 April again pushed its lines forward despite the heavy fire from enemy positions on its exposed right flank. A platoon from the 763d Tank Battalion, covering the advance of 3/383 on the left of the regimental zone, managed to reach positions from which it delivered direct fire on the town of Shuri, 1,000 to 1,500 yards to its front. The 3d Battalion held up for the night in firm possession of Hill 138, 500 yards forward of American lines on either flank. through Kuwan and Miyagusuku during a day-long drive which revealed deeply dug-in enemy positions, protected by mine fields, throughout the rugged hills and ridges to the east and southeast of Machinato airfield. The American build-up in southern Okinawa continued despite the harassment of enemy air raids which hampered orderly unloading and severely curtailed the night movements of vehicles. At 0600 on 30 April the 1st Marine Division was attached to XXIV Corps and march serials of the 1st Marines and 1st Tank Battalion began moving south to the 27th Division area. The Army division, meanwhile, had continued its attack in the area south of Machinato airfield. At 1000 as the first Marine units began moving into the front lines, the 27th Division halted its forward progress and disengaged its advance patrols which had been caught in a heavy fire fight. 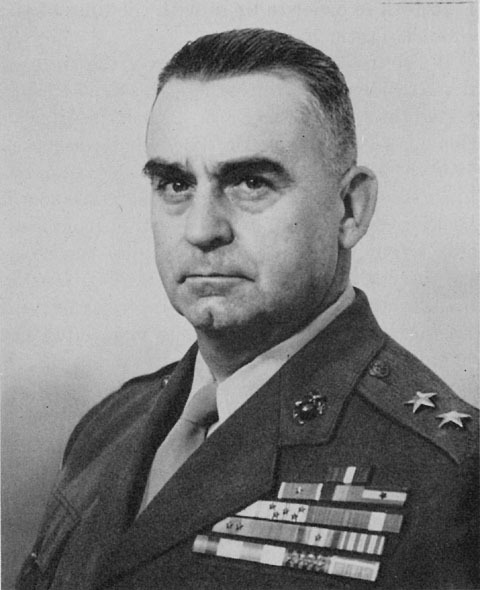 MAJOR GENERAL PEDRO A. DEL VALLE, Commanding General, 1st Marine Division at Okinawa. While the 1st Marines took over the right of the 27th Division's lines, the 77th Division completed the relief of the 96th. The Hill 138 position of 3/383 occupied on 29 April was taken over by 3/306, and 1/306 relieved 2/383 on its lines southwest of Maeda. At noon General Bruce assumed command of the area from General Bradley. Throughout the day the 307th Infantry attempted to improve its positions on the escarpment. Infantry-engineer teams with scaling ladders and cargo nets negotiated the vertical cliffs at the escarpment's top under cover of every available supporting weapon the regiment could muster. Once on the naked top, however, attackers met a storm of enemy fire they described as "all hell rolled into one. "47 Eventually the sheer weight of punishing metal thrown forced them back to defensive positions of the previous night. The character of Japanese resistance met on 30 April by the 307th Infantry was typical of the type the 96th Division had faced since L-Day. When General Bradley withdrew his troops for a short rest and rehabilitation period, the ranks of the "Deadeye Division"48 were sadly depleted. The infantry regiments had suffered 2,504 battle casualties with 353 men killed in action. The division left an estimated 7,170 enemy dead in the wake of its advance. The major gains on the XXIV Corps front on 30 April were made by the 32d Infantry. With the 17th Infantry stalled in its attacks on Kochi Ridge, General Arnold shifted the 7th Division's main effort to the left flank. Behind a wall of artillery, air, and NGF support 1/32 gained the ridges southwest of Kuhazu after a 1,200 yard advance. That night the battalion was subjected to a ceaseless round of counterattacks and infiltration attempts that delayed its relief by 1/184 the following morning. As the 184th Infantry took over the 32d's lines on 1 May, both units had to fight their way into position and little progress was made during the day's action. The savage resistance that thwarted the 307th Infantry's attack on 30 April continued on 1 May. With the 306th supporting its advance with fire into the flank and rear of Japanese positions on the escarpment, the 307th jumped off with all three battalions in assault. When the troops dug in early in the afternoon to meet the inevitable nightly counterattacks, they had pushed at heavy cost through some 300 yards of hotly-contested ground on the right and gained 100 yards on the left. The 1st of May marked the official entrance of the 1st Marine Division as a unit into the southern front although the 11th Marines had supported the 96th and 27th Divisions throughout most of the April fighting.49 The artillery battalions of those units remained in position to continue support of the 1st and 77th Divisions in their drive southward.50 General del Valle assumed command of the 27th Division's former zone of action at 1400, and the Army troops assembled for movement north the following day. General Griner's men killed or captured an estimated 5,019 enemy in their battles for Kakazu Ridge, the Urasoe-Mura Escarpment, Machinato airfield, and Item Pocket. However, during the 12 days since it had jumped off in attack on 19 April, the 27th Infantry Division had paid a price of 2,661 battle casualties, 316 of them listed as killed in action. Had the division's casualty rate of 19-30 April been continued, the end of the Okinawa campaign would have found every man in the original T/O buried or hospitalized. ENEMY FIRE sweeps the gorge south of Machinato airfield as Marines of 1/1 dash across the open ground on 2 May. The 3d Battalion, 5th Marines relieved the 106th Infantry in the center of the division line at about 1400, suffering a few casualties in the process. All reliefs by Colonel Griebel's regiment were completed by 1700, and patrols reconnoitered the zone of advance in preparation for a division attack on 2 May. General Hodge had instructed General del Valle earlier in the day that he was to do all he could by fire and movement to assist the advance of the 77th Division,52 an assignment that would fall to the lot of the 5th Marines. to Uchima and Jichaku. The Thirty-second Army was well aware, however, that "powerful elements of the Division scattered and remaining in the cave positions within the [American] lines [were] still offering resistance. "53 It was these enemy holdouts that faced the 1st Marines. A driving rain fell throughout 2 May and limited visibility and the effectiveness of air support. During the night one company of 3/184 advanced as far as Gaja Ridge, the last high ground before Conical Hill, the key Japanese position on the east coast. This advantage was lost at the end of day when company officers withdrew their men because of excessive casualties suffered. Positions held by 1/184 near Kuhazu were extended despite extremely strong resistance. The Japanese positions on Kochi Ridge and the hills to the south again proved too much for the 17th Infantry, and the men of 3/17 and 2/17, pinned down by fires from front and flanks, were unable to gain the ridge. The pattern of assault for the 77th Division on 2 May followed that used the day before. The 307th attacked along the top of the escarpment and the 306th supported the movement by fire. Again the ferocious defense put up by the enemy 32d Regiment and elements of the 63d Brigade limited advances to a few yards, each one taken only after close quarter grenade and satchel charge exchanges. Machine-gun and cannon fire swept all exposed areas, and pillboxes continued to resist even after explosive charges had been dropped into the vents and gun ports. The 307th was forced to use all its organic weapons in order to retain the ground won. from high ground to their immediate front. By 1100 casualties in assault platoons were so heavy that the battalion had to withdraw under cover of a smoke screen to reorganize. Enemy artillery followed the men back over the broken ground causing further losses.57 The remainder of the day was spent concentrating supporting weapons fire on the high ground in the 307th's zone. The frontal and flanking fire that had driven back 2/5 stopped the 3d Battalion shortly after it had crossed the line of deparature on 2 May. "The advance was untenable and had to be withdrawn to initial positions. "58 The battalion spent the day in limited patrolling and extensive mopping-up action. 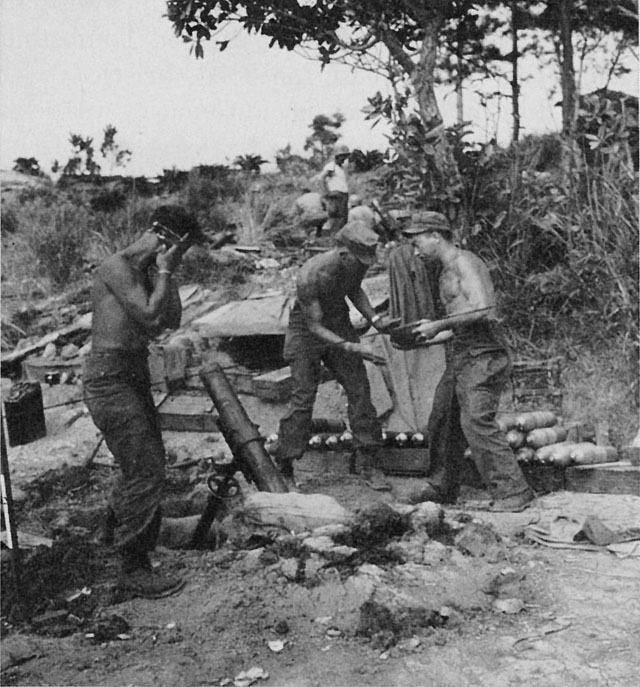 Because the 5th Marines had failed to advance, Company L on the left of 3/1 was stopped when Lieutenant Colonel Sabol's battalion made its attack. Company K, however, was able to move out through Miyagusuku and progress beyond the edge of the town. At 1446, Colonel Chappell received orders from division to change the direction of his regiment's attack from due south to southeast. This change would bring pressure to bear on the flank of many of the positions holding up the 5th Marines and enable Company L to advance. FIRING LINE of 1st Division Marines engages the enemy defenses in the broken ground southeast of Machinato airfield. Company C to move through Nakanishi and cross the ravine where it angled north toward Miyagusuku. At the same time Company B was to force the mouth of the ravine and take the high ground to the south. The battalion reserve, Company A, was to be committed on either flank of Company B as the situation dictated. Company C attacked through Nakanishi at 0920 and was ready to plunge into the ravine by 1000. The slowness of the attack on his left led Colonel Chappell to warn Murray to proceed with caution in order not to expose his troops to enfilade fire. Self-propelled assault guns had been used against the enemy positions on the south side of the ravine since the attack opened in the morning. Company B was able to move into the mouth as these positions were partially silenced. However, when the men reached the floor of the defile they were caught in the rear by fire from Japanese in caves on the northern side. Heavy flanking fire from a nose of ground at the bend in the ravine poured down on them. Company C was also punished by fire from this position, and although the men managed to brave the fusillade and reach a defiladed position, the unit was cut off front and rear by the enemy fire. A general withdrawal was ordered at 1300 and the companies pulled back to high ground using smoke cover to evacuate their casualties. When the division order shifting the direction of attack was relayed to Murray, he secured permission to take the plateau across the ravine in order to protect his flank before making the change. Because both Companies B and C were badly shot up, he requested a company from 2/1 to support the attack, and Company F started moving up. The last major element of the 1st Division moved south on 2 May when the 7th Marines shuttled its battalions to the vicinity of Uchitomari. The following day, Colonel Snedeker moved his command post to a point 200 yards north of Gusukuma, and the 1st and 2d Battalions displaced to beach defense positions northwest of Machinato airfield. For the attack on 3 May, the 1st Division designated two objective lines for the 1st Marines, the first stretching along the railroad track from the bridge across the Asa Kawa to a point opposite Miyagusuku and the second from the same bridge to Uchima and including Dakeshi. The boundary between regiments was switched to intercept the corps boundary just north of Dakeshi. The 5th Marines was given the job of cleaning out the tangled gorges and precipitous hills that became known as the Awacha Pocket. Infantry on the outskirts of Awacha. The volume and intensity of enemy fire received during the day indicated that the 1st Division's turning movement to cut off the Awacha Pocket was to be bitterly contested and costly to the attackers. When 2/307 was relieved by 2/5 at Awacha, the Army battalion shifted to the left and took over part of 1/307's zone. The regiment, using all three of its battalions, mopped up the top of the escarpment and the upper part of its reverse slopes during the day. Supported by fire from the 306th Infantry, the assault companies worked over enemy emplacements and sealed caves and pillboxes to consolidate their hold on the high ground. 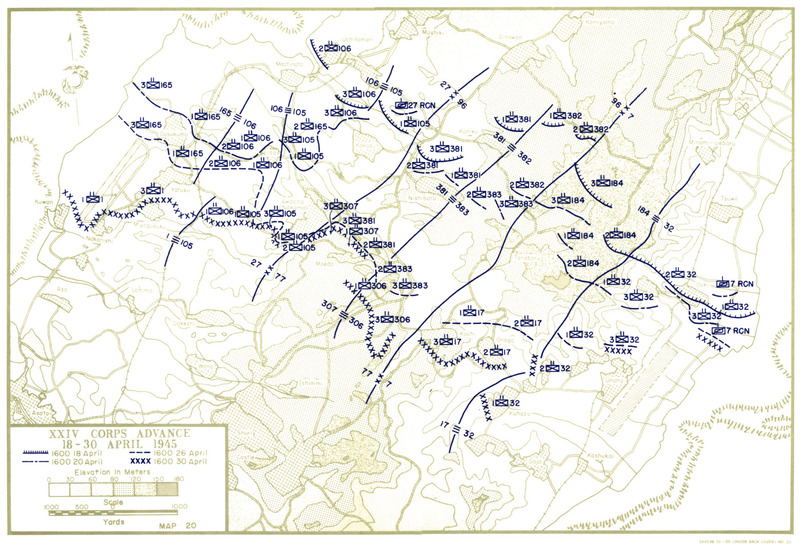 After the day's action the 307th held lines that commanded the Japanese positions all the way to the Shuri foothills. The enemy, although pushed back, was still making a determined resistance from caves on the reverse slope and counterattacking with company- and platoon-sized units to regain key ground. The 306th Infantry from its positions forward of Maeda and on Hill 138 also supported the attack of the 17th Infantry at Kochi during the day. Both 1/17 and 3/17 tried again to take Kochi Ridge but the enemy laid down a massive artillery and mortar concentration, backed up by small-arms and machine-gun fire, to drive the assault troops back. The 184th Infantry maintained a constant pressure against the outlying positions blocking the approach to Conical Hill but advances for the day were negligible. All along the XXIV Corps front the ferocity of enemy resistance was undiminished. As veteran Japanese units were decimated, they were rebuilt with rear area replacements and new infantry elements were introduced to the line. The prediction of General Hodge at the start of the 19 April attack that "it is going to be really tough . . . and that I see no way to get [the Japanese] out except blast them out yard by yard,"64 was being grimly fulfilled. 1. Okinawa Operations Record, 55. 3. Unless otherwise noted the material in this section is derived from Okinawa: The Last Battle; Tenth Army AR; XXIV Corps AR; XXIV Corps Arty AR; 7th InfDiv AR; 27th InfDiv OpRpt; 96th InfDiv AR. 4. IIIAC Arty AR, 20-21. 5. Okinawa Operations Record, 53-59. 6. 11th Mar SAR, n. p. Col W. S. Brown, CO of the 11th Mar, joined the staff of BrigGen Sheetz as liaison officer and remained there until 29 April when his battalions reverted to his command. MajGen W. S. Brown Ltr to CMC, 26Feb55, hereinafter cited as Brown 1955. 7. Okinawa Operations Record, 63-64. 9. CTF 51 AR, Part III, 33-35; Part V, Sect H, 8-9. 10. CICAS Trans No 198, 22d Regt OpOrd No 63, 1600, 12Apr45. 11. Tenth Army G-2 Rpts Nos 18-20, 13-15Apr45. 12. Okinawa Operations Record, 65. 13. Ibid., Record of the 24th Div, 10. 15. Unless otherwise noted the material in this section is derived from Okinawa: The Last Battle; Tenth Army AR; 7th InfDiv AR; 27th InfDiv OpRpt; 96th InfDiv AR. 16. Tenth Army G-2 Rpt No 19, 14Apr45. 17. IIIAC G-2 Rpt No 38, JOB Supplement, 9May45. 18. 1st MarDiv G-2 PrdRpt No 37, 8May45, Translation No 46, Organization of the 12th IIIB, 12Apr45. 19. Tenth Army G-2 Rpt No 22, 17Apr45, JOB Summary, 8-14Apr45. 20. For an examination of this artillery ammunition problem see Chap VIII, "Logistical Progress." 21. XXIV Corps Arty AR, Annex C, Enclosure 2. 22. CTF 51 AR, Part V, Sect C, 39-42. 23. Okinawa Operations Record, 67-69; Record of the 24th Div, 11. 24. See 27th InfDiv History, 543-547 for the interesting story of how this engineer unit masked its matériel build-up for the bridging operation from the Japanese. During the five days prior to the attack, the battalion literally learned from the bottom up how to erect the Bailey bridge, a piece of equipment they had had no occasion to use in previous operations. 25. Unless otherwise noted the material in this section is derived from Okinawa: The Last Battle; XXIV Corps AR; 7th InfDiv AR; 27th InfDiv OpRpt; 96th InfDiv AR. 26. CTF 51 AR, Part V, Sect C, 4Z; CTF 52 AR, Part III, 34-35; Part V, Sect E, 8; Tenth Army AR, Corrections by CG, 77th InfDiv, 11Oct45. 27. Okinawa Operations Record, 69-70; Record of the 24th Div, 8. 28. CTF 51 AR, Part III, 50; Part V, Sect C, 42; XXIV Corps Arty AR, Annex C, Enclosure 2. 29. BrigGen Sheetz, CG, XXIV Corps Arty, later said he doubted that as many as 190 Japanese were killed by the morning's artillery preparation. Quoted in Okinawa: The Last Battle, 194. 30. CinCPac-CinCPOA Bull 212-45, Translations and Interrogations No 39, 30Aug45, 62d Div Battle Lessons Priority Dispatch No 19, 20Apr45, 47-49. 31. Of these 22 tanks all but five were eventually salvaged by maintenance men of the 193d TkBn and the 27th InfDiv. 27th InfDiv History, 619. 32. The position was named for its location on the 1:25,000 tactical map used by Tenth Army. Its major strong points were located within the 200-yard grid square 7777-I (or Item in the military phonetic alphabet). 33. CICAS Trans No 246, 32d Army OpOrd No 170, 0830, 22Apr45. 34. CTF 51 AR, Part III, 54-57; Part V, Sect H, 9. 35. CICAS Trans No 246, 32d Army OpOrd No 170, 0830, 22Apr45. 36. Tenth Army G-2 Rpt No 30, 25Apr45. 37. Unless otherwise noted the material in this section is derived from Okinawa: The Last Battle; XXIV Corps AR; 7th InfDiv AR; 27th InfDiv OpRpt; 96th InfDiv AR. 38. Okinawa Operations Record, 69-76; Record of the 24th Div, 10-14. 39. Tenth Army AR, Chap 7, Sect III, 131. 40. 1st MarDiv G-3 Jnl, 27Apr45. 42. Unless otherwise noted the material in this section is derived from Okinawa: The Last Battle; XXIV Corps AR; 1st MarDiv SAR; 7th InfDiv AR; 27th InfDiv OpRpt; 77th InfDiv OpRpt, Okinawa; 96th InfDiv AR; 1st Mar SAR; 5th Mar SAR, 22Apr-23Jun45, hereinafter cited as 5th Mar SAR; 7th Mar SAR. 43. Okinawa Operations Record, 74. 44. CTF 51 AR, Part III, 64-70. Ships' crews suffered 38 KIA, 80 WIA, and 24 MIA as a result of the three day attack. Ibid., Part V, Sect H, 9. 45. 1st Bn, 1st Mar SAR, 23Feb-21Jun45, n. d., 3, hereinafter cited as 1/1 SAR. 46. 3d Bn, 1st Mar SAR, Phase I and II of the Nansei Shoto Operation, 10Jul45, 9, hereinafter cited as 3/1 SAR. 47. 77th InfDiv OpRpt, Okinawa, 37. 48. According to the division history, the 96th received its nickname from the constant insistence of BrigGen C. M. Easley, ADC, on crack marksmanship from all ranks during its training period. O. R. Davidson, et al, The Deadeyes: The Story of the 96th Infantry Division, (Washington, 1947), 5, hereinafter cited as 96th InfDiv History. 49. "On 29 April, Headquarters, 11th Marines assumed command of its scattered battalions in the zone of and reinforcing the 27th Division, the two battalions with the 7th and 96th Divisions displacing into that area. All four battalions of the 11th Marines were commended by the Army divisions with which they had served." Brown 1955. 50. Only one battalion, the 249th Field Artillery, went north with the 27th Div to furnish support during mop-up activities. This unit returned to the southern front on 29 May to reinforce the fires of IIIAC Arty. 51. 2d Bn, 5th Mar SAR, Okinawa, 1Apr-22Jun45, n.d., 2-3, hereinafter cited as 2/5 SAR. 52. 1st MarDiv G-3 Jnl, 1May45. 53. Okinawa Operations Record, 80. 55. 1st TkBn Summaries of Tank Action, 15Apr-23Jun45, hereinafter cited as 1st TkBn Summary. According to the 3/1 SAR, 10, the tanks supporting them were Army mediums, but 1st TkBn lists them as belonging to its own Co A. The flame tanks were from Co B, 713th TkBn (USA) which was attached to the 1st MarDiv and later IIIAC. 58. LtCol M. C. Roth Ltr to CMC, 18Mar55. 60. 1/1 SAR, 4-7. The CO of Co F, Capt Edward R. Tiscornia, was killed by a sniper as his unit moved up and as a result of the necessary reorganization the advance across the ravine was delayed until after dark. 61. Ibid., 7-8. The infantry-engineer patrol which moved out that night was almost cut off by a large enemy unit that attempted to work its way around to the patrol's rear. The patrol discovered that the coastal road was blocked by a huge crater flanked by rice paddies and consequently was unsuitable as a tank route. 64. CG, XXIV Corps Ltr to CGAFPOA, 17Apr45, quoted in Okinawa: The Last Battle, 185.